Happy Wednesday everyone! Today I have chosen to do a different approach on a closet. I am simply going to list things that the person that designed this closet did to make this closet more functional. I'm going to let you, my fabulous readers, decide which way you like me to do this segment. Just post a comment below telling me whether you like the old style or the new style. Alright, enough blabbering, let the listing begin! Today's closet is much larger than those shown in the previous two segments. 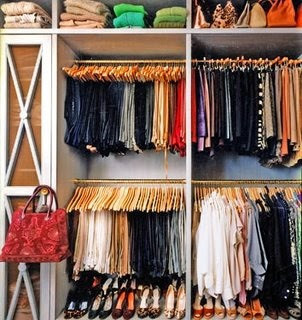 So for those of you with a closet this size, it would be beneficial to compare your unorganized closet with this one so that you can find little organizational skills that can work with you and your closet. Again, please let me know what you think of the new style of this segment! Happy organizing!